The countdown has officially begun to HBO’s Westworld, just one month before the long-awaited premiere. To celebrate, the new HBO cyber-western has a creepy new poster going up close and personal with the androids populating its fictional world. HBO released a striking new poster for the October 2 premiere, offering a much closer look at those creepy muscled automatons lurking the background of prior trailers. The dual meaning of its “Every Hero Has a Code” tagline is reasonably clever as well. 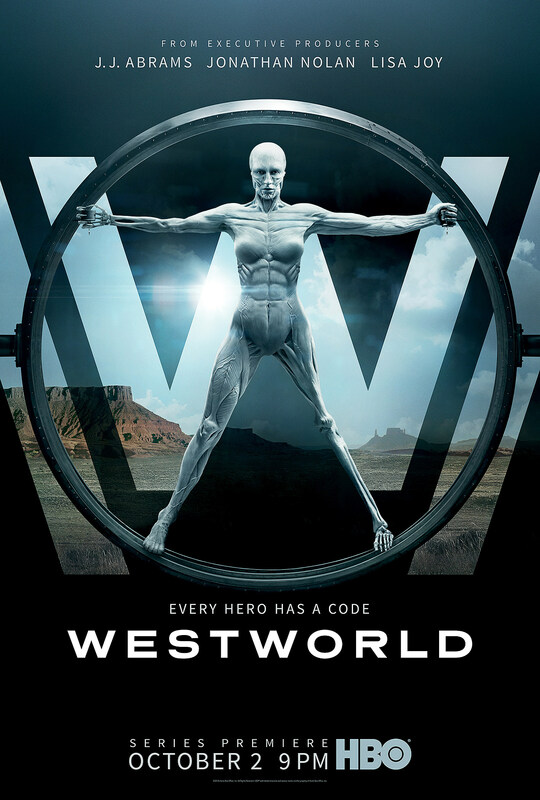 Now set to premiere on October 2, Bad Robot’s Westworld remakes the 1973 tale as “a dark odyssey about the dawn of artificial consciousness and the future of sin.” Person of Interest creator and The Dark Knight co-writer Nolan wrote the script with Burn Notice scribe Lisa Joy, with Nolan directing the pilot and finale, and Michelle MacLaren helming the penultimate outing. Nolan and Joy executive produce with J.J Abrams, Jerry Weintraub and Bryan Burk. The new series features among its cast Anthony Hopkins, Evan Rachel Wood, Ed Harris, X-Men star James Marsden, The Hunger Games and Boardwalk Empire star Jeffrey Wright, Thandie Newton, Raising Hope lead Shannon Woodward, 300 star Rodrigo Santoro, Angela Sarafyan, Simon Quarterman, Sidse Babett Knudsen, Ingrid Bolsø Berdal, Ben Barnes, Jimmi Simpson, Lili Simmons and Clifton Collins, Jr. Among WESTWORLD’s main players are: Dr. Robert Ford (Anthony Hopkins), the brilliant, taciturn and complicated creative director, chief programmer and founder of Westworld, who has an uncompromising creative vision for the park. The Man in Black (Ed Harris) is the distillation of pure villainy into one man. Dolores Abernathy (Evan Rachel Wood) is a provincial, beautiful and kind rancher’s daughter, who begins to discover that her entire idyllic existence is an elaborately constructed lie. Teddy Flood (James Marsden), a new arrival to a small frontier town, quickly proves both his charm and talent with a revolver. Beautiful, razor-sharp madam Maeve Millay (Thandie Newton) has a genius for reading people and a knack for survival, but her seen-it-all-before worldview is about to be challenged. Bernard Lowe (Jeffrey Wright) is the brilliant and quixotic head of the park’s Programming Division, whose keen observation of human nature provides him with boundless inspiration for his life’s work: creating artificial people. Charlotte Hale (Tessa Thompson) is a mysterious and savvy provocateur with a unique perspective on Westworld. Theresa Cullen (Sidse Babett Knudsen), Westworld’s head of Quality Assurance, is responsible for keeping the park from sliding into unscripted chaos. A first-time visitor, William (Jimmi Simpson) is initially wary of the park’s more lascivious attractions, but slowly uncovers a deeper meaning. Hector Escaton (Rodrigo Santoro), Westworld’s perennial “most wanted” bandit, subscribes to the theory that the West is a wild place, and the only way to survive is to embrace the role of predator. Elsie Hughes (Shannon Woodward), a sardonic rising star in the Behavior Department, is charged with diagnosing the odd quirks of behavior in the park’s hosts. Armistice (Ingrid Bolsø Berdal) is a savage fighter and brutal bandit, whose ruthlessness is surpassed only by her abiding loyalty to her fellow outlaws. Logan (Ben Barnes) is a veteran guest whose hedonistic romp through the park is equally motivated by self-indulgence and a desire to help his friend, William. Lee Sizemore (Simon Quarterman) is the head of Narrative, whose storylines tantalize the guests, while his temperament grates on his colleagues. Clementine Pennyfeather (Angela Sarafyan), one of Westworld’s most popular attractions, is perfectly beguiling, by design. Stubbs (Luke Hemsworth) is the no-nonsense head of Security, charged with monitoring host and human interactions and ensuring the safety of the guests. Lawrence (Clifton Collins, Jr.), a charming but lethal outlaw, has a knack for maneuvering and negotiating the various criminal elements of Westworld. Check out the trailer again below, while we wait for the October 2 premiere.